More elfin houses . . . for this one I drew floorplans that fit inside a matchbox. 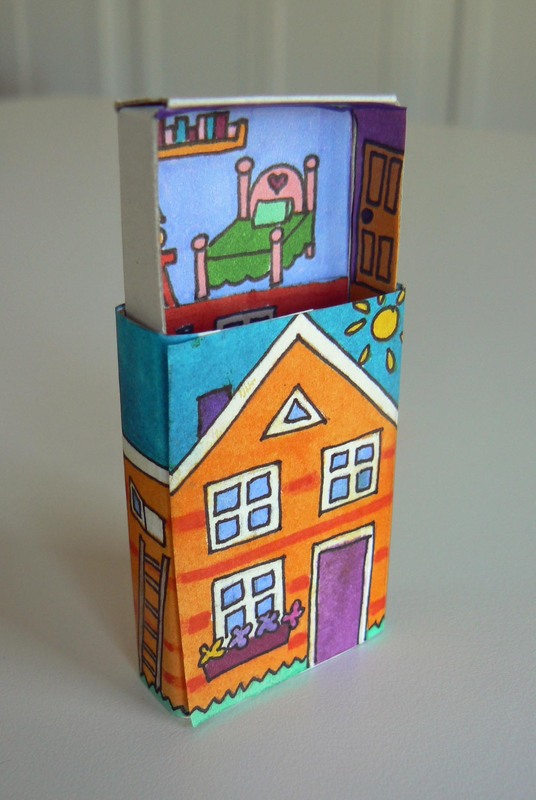 If you take a childlike pleasure in coloring, or if you happen to have an actual child who likes to color (and has excellent fine motor skills), I made tiny coloring pages so you can make your own matchbox house. 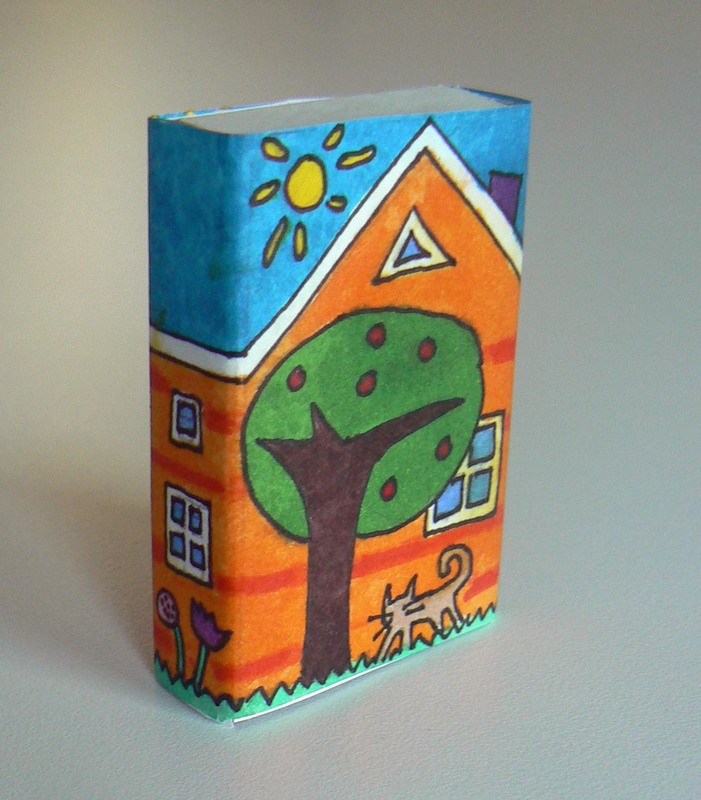 The exterior wraps around a standard matchbox. Interior is supposed to fit the inside tray but may need some judicious trimming. I used Sharpies for saturated color and generous amounts of glue stick (after failed attempts with other sticky substances) to adhere. Enjoy! And send me pix, please. you are amazing, you are. 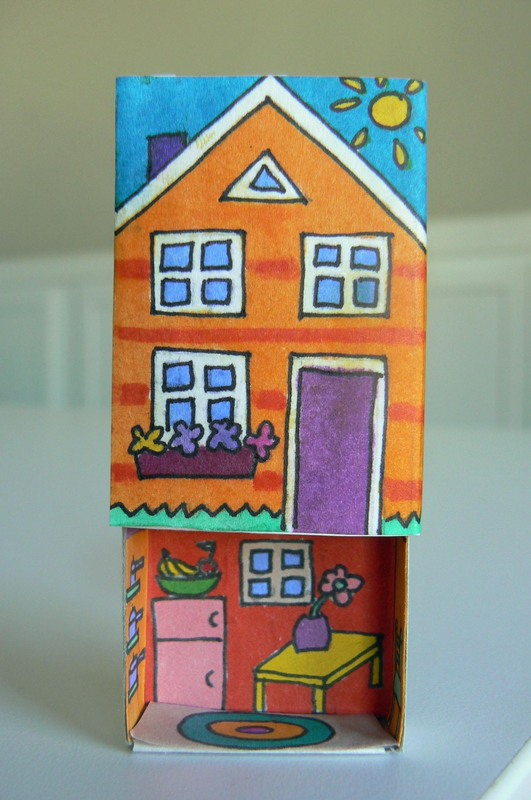 these matchbox houses may be my grandaughter’s favorite Christmas presents! Amazing! Excellent coloring work. I love the upstairs, downstairs. That’s so cute. I love it. Would be great place to keep a tiny toy. Carol–thanks for pointing this out! I re-did the pdf so it should work. Something funky happened with the other pdf, methinks. Ignore the little floor and ceiling pattern in the middle of the coloring sheet–I was going to add a floor to the inside but decided it was too nutty, even for me. I’m in my forties, by the way, and as obsessed as ever with coloring tiny houses . . .
It’s done and much admired. I copied your colour scheme too as was too excited and eager to get going to make up my own. Was going to post a photo but couldn’t on here. Thanks for the new PDF!! Carol, I’m so glad the new pdf worked!!! Yay!! aaaw this is soooo adorable and such a great and funny idea. very lovely, thank you for the sharing and the great designs. Cute! What size are the boxes you use? Thanks, Kirsty! Matchboxes seem to come in different sizes. The ones I have currently are 2″ x .5″ x .5″ I did have to do some judicious trimming to make the interior fit. I must have drawn the design for a slightly larger variety of matchbox! This is adorable. You are so creative. Thank you for sharing. Any kind of fine-point permanent marker will do! Sharpie brand comes in an array of colors, but I’m sure there’s an equivalent brand in the U.K. Thank you for asking! Happy coloring! Can I have a matchbox House of my own? Any season you may think of me! I’ll get to work on one!